We develop mobile applications for all the major platforms: iOS (iPhone and iPad), Android and Windows Phone. Creating an app can give you an edge over the competition, in some industries customers and end users will consider it a requirement that your company or product has a app available. We use proven technology that enables us to quickly create polished and effective apps for all the mobile platforms you want to cover. We offer multi-platform discounts to make it easy for you to allow users of all types of devices to download your app. Contact us for more information about mobile apps and we can talk through your options. We can make your app do anything you want. It can just contain static content that a user can navigate, or load content from a remote server or API, either your own or a solution created and hosted by us. Your app can take advantage of the device’s features, such as the camera, geo-location services, accelerometer, notifications, compass and NFC. Sometimes you need to get a message out to your users quickly. You can include a push notifications feature in your app, which will allow you to send messages to everyone who has your app installed within minutes. 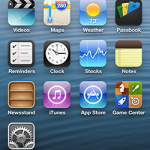 This is the operating system used by Apple’s mobile devices such as the iPhone and iPad. We can create an app for either one, or a universal app that works on both. iOS has a major share of the mobile devices market – 44% in the UK* – so it’s definitely worth creating an app for its users. iOS offers a stable and reliable platform to create client app with, and client can be sure to reach a high number of end users given its large market share. We have the latest Apple hardware to use for developing, testing and deploying app, so to make sure it’ll impress customer’s right from the launch day. Created by Google and launched in 2009, this mobile operating system is installed on over 500 million activated devices worldwide. 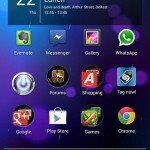 Android is installed on many different mobile handsets from large manufacturers such as HTC, Samsung and Sony. In the UK Android accounts for 30% of the UK market share*, so it certainly can’t be ignored when it comes to mobile apps. Android already has over 700,000 apps in the “Google Play” app store. Device manufacturers make many tablets for Android too, so app should be made to work with either Android phone or tablets, or both. Microsoft launched Windows Phone 7 in 2010 and experienced manufacturers such as Nokia, Samsung and HTC have created great devices that run Windows Phone. 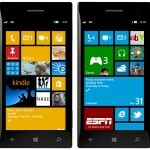 In 2012 Windows Phone 8 was launched, which added many improvements and new features to the platform. The market share* sits at around 5% and is climbing fast as more people realise the potential of Windows Phone. We highly recommend releasing app for Windows Phone. We have extensive experience creating apps that take advantage of all the features of this operating system. If you have any more questions about above services, please get in touch.